We ship direct, worldwide and normally next working day as all our products are typically available from stock. If you have an unusually large order or are concerned for delivery, feel free to contact me via email. Details are on the Contact page. After you’ve placed your order an acknowledgement email will be sent. This is not automated and happens only after a human has checked your order, so don’t be alarmed if it does not happen until the next morning. If we happen to be away at exhibition (weekends) it will be when we return. Can I mix different controller types (servo, solenoid, stall) on the same layout ? Yes you can. You are free to mix servo, solenoid or relay controllers as your needs require. You can even move a turnout via solenoid and bounce an interlocked semaphore signal driven by a servo with a single button push. On a DC layout you can also have a relay fire to control section power at the same time. Our router also provides sophisticated route setting for all layout control boards irrespective of their type. Which servos do you recommend? Any servo in the 5-10g range will do that’s rated at 6 volts. This covers just about all of the servos that I know of. I find the 5-10g servo range to offer the best balance of size, performance and cost. You can use any modern manufacturer’s servos. If you are planning a heavy duty feature that requires a bit of lifting or torque then look up to the standard servo sizes. These really are amazing devices. Although I don’t use them myself, the specification and price of these servos (HK15139 look good at £3.05 each (at time of writing). With plenty of torque for the larger G scale use they should stand the rigors of the British weather. Points from ‘N’ to ‘G’ gauges: HK-15178. Semaphores, use a digital miniature servo: HK-5330 (will require you to change the plug). In the garden waterproof servos: HK15139. If you must not have a power on twitch (2mm fine scale and delicate work): HK-SCM9-6. Surface mounted ultra micro servos (require care when fitting) HK3D-1.7R or HK3D-1.7L. Nano (small) conventional servo for underside or surface mounting TGY-TS531A. ** Don’t forget to check you have selected the UK or European warehouse! *** If you also find a really good servo that’s inexpensive then share a link with me and ill share it with everyone else. Make sure you select the appropriate shipping location from Hobbyking. Where do I buy servos from? Ebay is a good source of inexpensive servos and can offer a bewildering array. I buy from Hobby king in the UK (www.hobbyking.com) and usually take their least expensive 6 volt servo in the 5-10g range such as the HK15178. On my most recent order I paid £1.70 each. Most local model shops will sell them, especially those offering radio controlled aircraft, buggies or boats. See the section above “Which servos do you recommend” for specific links to suggested servos. How can I power my frogs? Use our servo controller with integrated frog switch (Servo 4R). Add a relay driver board and integrated relay. Add a micro switch that’s activated by the servo horn when it moves. 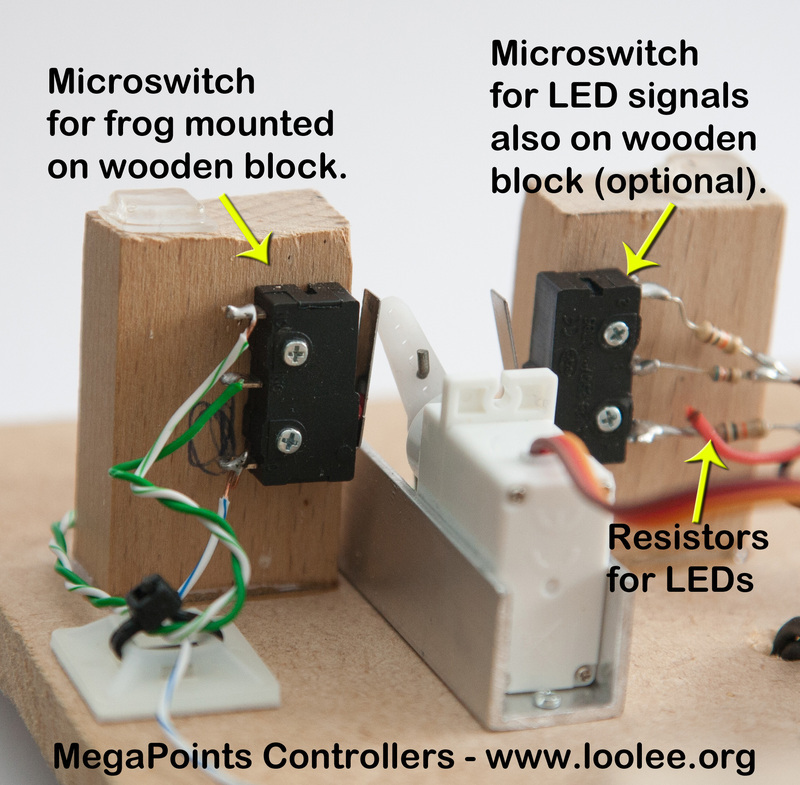 Fit the micro switch to a wooden post placed near the servo output arm. When the servo moves the points it also operates the switch. See the picture or the video section for an electrofrog installation. What other components may I require when installing servo controllers? Don’t cut the servo leads or remove the plugs. Its much easier to buy inexpensive servo extension leads and cut these in half. You can then extend the extension lead around your layout to suit and the servo can just plug in or unplug as required. Look on eBay for “servo extension leads”. I prefer the JR variety to Futaba, however both will work. You can find multi packs for a couple of pounds. Conventional extension leads are male one end and female the other. Hobbyking also stock a range such as this listing. If operating the Servo Controller without a DCC interface you should use toggle switches or levers to control each servo. You can buy toggle switches in 10 packs on eBay for around £2.50. The simplest are listed as SPST (single Pole, Single Throw) and will work fine. If you plan to switch an LED as well, consider the DPDT variety (Double Pole, Double Throw). The cost about the same as the SPST switches. Go for the SPST push to make (non latching) button. eBay has a huge array and prices around £2.50 per pack of 10. You can go mad with the sizes and colours ? I use micro switches to polarize the electrofrog on points. These can easily be fitted (balsa and super glue) to the side of servos so the servo arm operates the switch as the points move. There are many other mounting options and I’m sure you’ll fine a method that’s right for your layout. Experiment and have a bit of fun. eBay has plenty of variety and the smallest current carrying capability will do. Expect to pay around £2 for a bag of 10 or 15. I use 0.62 mm piano wire available from our web site here or direct from us when at an exhibition. This has the right degree of flexibility for points with baseboard thicknesses between 8mm – 20mm. Where can I get those amazing semaphore signals I see you demonstrating? Speak to Jon at BoltonsBits. He custom makes amazing ‘O’ gauge semaphores including the robust version I had made for my exhibition stand. Why don’t my semaphore signals bounce like yours? I’ve observed an interesting phenomenon when using TowerPro SG-90 servos configured as semaphore signals. The servo is not fast enough to keep up with the acceleration curve as the semaphore falls from clear to danger the first time. This is the point the servo has to move fastest. What is strange is that the TowerPro SG-90 servo has a rated speed of 60 degrees in 1/10th of a second, exactly the same speed as stated on the HobbyKing servos I also recommend. The HobbyKing servos are able to keep up while the TowerPro servos are noticeably slower. I lack the equipment to determine whether the TowerPro is below spec. or the HobbyKing servo exceeds spec. The TowerProSG-90 servos are fine for points and just about anything else, but you will loose some resolution if configuring as a semaphore. It may help explain why your observed semaphore bounce dosent match what I have in the videos. I want to make my own cables and servo plugs, what do I need and where do I get it? If you decide to make your own extension servo cables you can follow these eBay links as a guide. The links will show you the type of crimping tool, crimps and plugs you will need as well as servo cable you’ll need. Don’t just buy the products we’ve listed, but use them as a guide. If you search you probably find the same items for less. Crimping tool and components link here. Note: Links can age out from eBay listings. Please let me know if this happens and I fail to notice. Which Aluminium channel should I use to mount my servos under track? I use 13mm (inside width) from B&Q. The store lists the dimensions as H 15mm, W 15mm, L 1M Anodised Aluminium. The link is hereor an alternative here. Before buying measure the width of your servo (or better still take it into the store with you and check it fits). Don’t forget our purpose made servo mounts available from the web shop. There are quite a few bargains to be had on eBay for those that know what they are doing. All our boards (except solenoid drivers) require a 12 volt regulated power supply (max 13.8 V). You’ll require 2 Amps per servo controller (12 way). I use a Fusion PS-101 (8 Amp) for around £17:00. There’s a dealer map here (use to locate a dealer near you), or follow the link here for power supply details. You can also try the Ripmax range of power supplies. They are in plentiful supply and available from any radio control model shop. The 200 Watt supplies have enough juice to power over 6 MegaPoints Servo controller boards. Their product range can be found here. For solenoid driver boards we recommend 16V to 18V AC at 30VA or 1.5 Amps. I test using the old H&M transformers. If you are looking for a new power supply, the Gaugemaster M1 or T1/T2 found on this page are excellent products. Which LEDs do you recommend? Farnel sell panel mount LEDs link here or use our pre wired 3mm LEDs (available in GREEN and RED) which just plug in. See the plug-n-play products for details here. What buttons do you recommend? I use a quality push button (normally open – push to close) with an epoxy base so they are less prone to melting during soldering. See the Farnel link here or use ours, pre wired ready to plug in. See the plug-n-play products for details here. Can I use stud and probe? Yes you can. It works great. How do I add an LED to each set of points to indicate direction rather then just ON or OFF? Version 1 & 2.0 MultiPanel Processors require an LED expansion board to provide the complimentary LED output. Version 2.1 and later MultiPanel Processors and version 2 LED expansion boards now drive a pair of LEDs per channel, so it’s built right in. Version 2 LED expansion boards are also compatible with version 1 MultiPanels. This website suggests the latest versions of all products or makes it clear where appropriate choice is available. See the plug-n-play section for details. Can I use lever frames with a MultiPanel? Yes you can. Just enable lever frame mode on the board (it’s in the user guide) and it will accept toggle switches or lever frames to control the turnouts. Certain multi user features will automatically be disabled when doing this as you cant have a lever in one position and the turnout in another due to a DCC command. Which one would be correct? If you need further advice on this, email or call me. 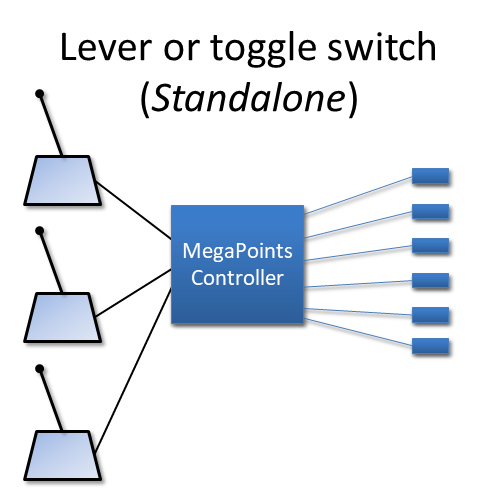 Use a lever frame or toggle switch directly connected to each MegaPoints Servo Controller. The Servo Controller will dutifully respond to the switch command. Uses make/break type switches (not passing contact). Switch input requires the Servo Controller to be in master mode. All other modes listed below require the unit to be in slave mode. Any connected switches or levers will be ignored when in slave mode. 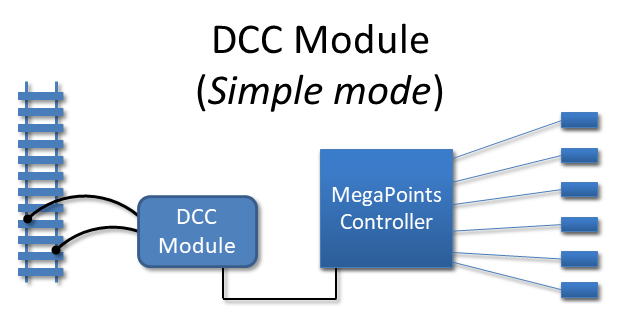 Connect a DCC module directly to a MegaPoints Servo Controller and the controller will instantly react to any valid input commands. This provides the simplest form of network control and each Servo Controller requires a dedicated DCC module. 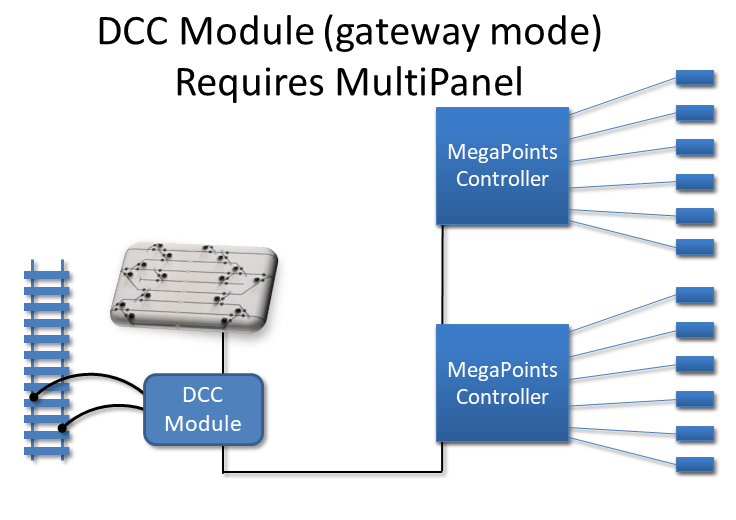 In this configuration the DCC module translates 12 DCC accessory addresses (user definable). 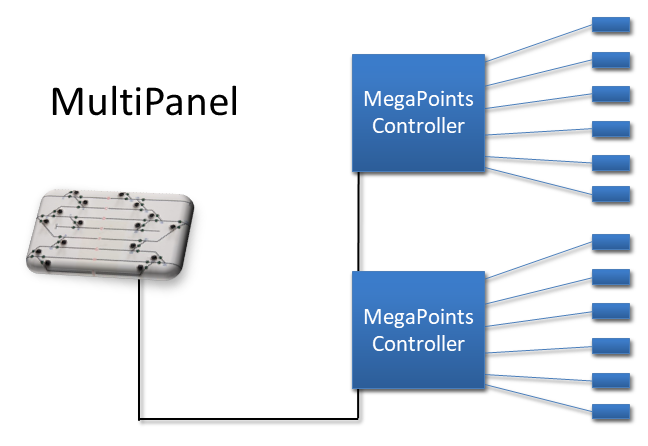 The MultiPanel can communicate with 16 separate Servo Controllers controlling up to 192 separate sets of points. MultiPanels use pushbutton switches for input (push to make) as the state of the points is held and maintained by the electronics. This allows you to connect as many MultiPanels as are required around a layout and they can all operate cooperatively. MultiPanels use LEDs to indicate track settings and this is instantaneously broadcast to all connected MultiPanels ensuring all displays remain up to date. When MultiPanels are present on a layout the DCC module takes on a new personality and can decode DCC accessory packets for the entire system (over 200 DCC accessory addresses). You only need one DCC Module per layout as the MultiPanel will ensure all other network devices and panels are maintained up to date. Any time a DCC accessory packet is received all connected MultiPanels are updated with the change. With a DCC module operating in gateway mode you are free to operate your layout switching via DCC command and mimic panel pushbutton. This provides the highest degree of flexibility as you can use both DCC and mimic panel pushbuttons at the same time. The routing processor communicates directly with an installed MultiPanel and allows a single button to configure the entire layout if desired. If relay modules are installed a single button can configure points, set signals and enable or disable power to designated track sections. Every time a change is made the MultiPanel display will instantaneously update. DCC accessory addresses beyond the first 192 are used to enable or disable routes set with the routing processor. I want to control 20 or more servos from a control panel and reduce layout wiring. Give me everything in one box. Begin with a MultiPanel Starter Kit. The MultiPanel Starter Kit includes two Servo Controller boards, a MultiPanel Processor, buttons and LEDs to test and all the cables to hook it up and control up to 24 servos. By following our online videos you’ll have it up and running on the bench in as little as 10 minutes. There’s no soldering to any of our boards and they include all the cables required for hook-up. Remember, absolutely no computer or programming attachments are required to get this running. All you need is ONE finger to press the buttons, configure and get going. I want to control up to 12 servos for points, semaphore signals, gates, decouplers or doors. All you need is a Servo Controller. Independent control of points, semaphores (upper and lower quadrant), gates, barriers, decouplers and doors.• Adjustable movement ranges and speed per channel. Includes three on board memories for route selection from a single button. Will drive our relay boards (10 Amps) for track power control etc. Includes 2 x network connectors for optional hook-up to a MultiPanel or other Servo Controllers. Can also control Tortoise switch machines with optional relay board. I want to operate my layout from one or more control panels without having masses of cables running around. Add a MultiPanel Processor board. No soldering to our boards. It includes the cables and plugs for connection. Easily (and inexpensively) expanded from 24 channels up to 192. Multiuser by design – it allows many people to share cooperative control around the layout if required. Supports subpanel use where master panels can restrict control to smaller sections of the layout on remote panels. Has (optional) plug in test button and switch boards for easy out of box testing. Only a single data cable leaves the control panel and connects to subsequent panels and Servo Controllers. Will optionally display DCC Accessory commands (requires DCC Module). I want to add one touch route setting to my layout. Add our Route Processor to any MultiPanel installation. Easy route creation via learning from your mimic panel). Includes the option to set track power and semaphore signals. Includes active route monitoring and will generate alarms if disturbed by other operators. I want to control servos from my DCC controller, tablet or PC. Provides over 200 DCC accessory addresses for your entire layout. Updates all your mimic panels in real time as DCC commands are issued. 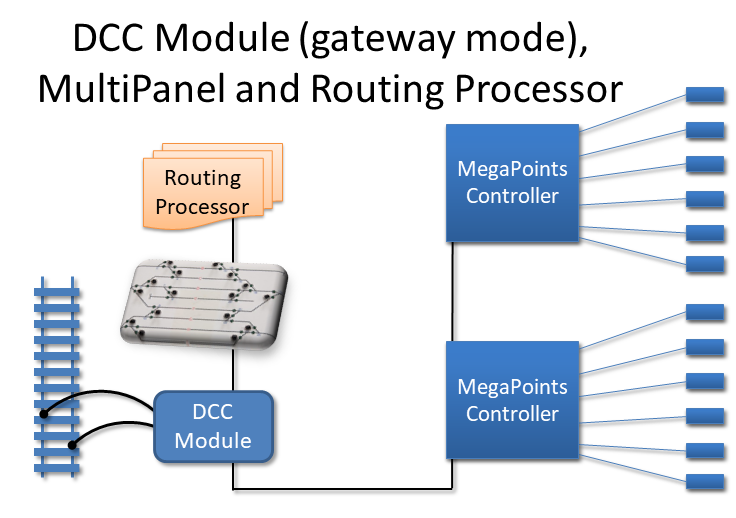 Provides DCC addresses to control the optional hardware Route Processor. I have a huge layout that needs control over long distances. Populate your layout with CAN Adapters. These extend the signal length to kilometers. The CAN Adapters connect local MegaPoints networks for long haul via a differential twisted pair cable and can be added as required. Excellent for outdoor use where distances can be significant. How to configure and operate our boards. Our web site also has downloadable documentation (printable) plus links to many other resources.